It was possibly the worst idea she'd ever had. "Miss_Frizzy, was it?" the pirate Krawk yelled at her over a crash of waves as he paddled the boat. "It's just MissFrizzy!" the snow Zafara corrected, annoyed that he'd somehow managed to pronounce an underscore. "Miss and Frizzy together, and the F is capitalized!" All of her siblings' names were that way as well, two words squished together into one name. The Zafara liked it well enough, but it was annoying to explain to strangers. "Huh," grunted the Krawk. "You Neopets and your unique names. But not one of you is really unique, isn't that right, Miss Treasure Hunter?" MissFrizzy didn't respond. He was right about that. She wasn't unique, and she was hunting for treasure. Thunder rumbled in the distance. MissFrizzy was pretty certain you weren't supposed to be in water if there was lightning—she wasn't sure if that applied to boats. But the Krawk had insisted it was only a "measly little squall" and that they would make it to Krawk Island in a jiffy. The boat lurched, and MissFrizzy clutched the side. It was so small it was barely able to fit the two of them, but the Krawk had assured her he'd used it masterfully in the past. He'd told some rambling story about collecting dubloons and avoiding mines. Interesting enough, but the Zafara doubted it was true. She only cared that his fare had been the cheapest she could find. She wanted to save her Neopoints for the hunt. Her siblings had been against the idea. "Don't go!" RojoChili the magma Blumaroo had wailed in dismay. At the time, MissFrizzy could tell he wanted to touch her, in order to hold her back. But his magma coat clashed with her snowy fur, and the smallest touch could spell disaster. He couldn't stop his sister from going without hurting her. "Please, sis. Anna will expect you to be here. Your birthday is in a few days, remember?" "Yes," she'd said to her brother. "I know. And you know what that means? Eight years of my life I've lived in Neopia, and I've never done anything!" "You've done lots of things," RojoChili argued. "No, I haven't. Nothing special. But I'm changing that right now, little brother. I'm only going on a short trip to Krawk Island. Please, don't stop me. I have to do this." "When will you come back?" the Blumaroo said, defeated. He could see the determination in her eyes. "When I've found some treasure!" she said emphatically. "Then I'll have something that proves I can go on adventures, just like any Neopet!" And now she was on an adventure. At least, she figured she should count this part. If they made it to Krawk Island alive it would be a miracle indeed. When the Krawk finally pulled up to the wharf MissFrizzy couldn't leap out fast enough. Land, sweet land! She hurried tossed the sailor his fare and hurried off. "Be careful with your treasure hunting!" The Krawk cackled loudly after her. She didn't get far before she bumped into someone. She promptly land on her rump. "Oof!" she said, brushing herself off as she stood up. "Sorry about that..." Looking into the face of the stranger, she was so startled she took a step back. Yet another pirate Krawk peered down at her. MissFrizzy glanced back in the direction of the wharf, just to make sure it was a different Krawk. "Did I hear something about you looking for treasure?" the Krawk asked. His voice was much lower than the Krawk which brought her to the island. "I think I can help you with that, miss." "Actually, my name is--" MissFrizzy began to correct him, then caught herself when she realized her hadn't meant to say her name. "Oh, um, really? Because that would be great," she said cautiously. There was something about this Krawk she didn't trust. "Wonderful!" the Krawk declared happily. "Then I am very pleased to be of assistance, missy. I happen to be the number one treasure expert on Krawk Island! I've helped more than one visitor in finding riches. That's not to say that it's easy, but I can tell that you're a treasure hunter, aren't you?" The Zafara nodded suspiciously and was about to politely decline his help when he flung an arm around her shoulders. "Just come right this way, Miss Zafara, and I will get you all set up for your little treasure hunt." He led her towards a rundown little stand with a map of Krawk Island spread across it. He quickly sat down on a small stool and slapped the map, a wide grin on his face. "This," he said, "is the key to you finding treasure on Krawk Island." "Well, it's a very nice map," said MissFrizzy. "But how will that help me?" "Ah, you're a smart one. This map, as a matter of fact, has all the possible coordinates for treasure on the island. I've carefully boxed each possible location for treasure. For a small fee of three hundred Neopoints, I'll let you take a gander at the map, as well as lend you digging rights for that area for three hours!" "That's correct! You see, on Krawk Island you can't just dig for treasure wherever you'd like, whenever you'd like. If any Neopet could do that, then we'd have no shortage of Neopets digging up our beautiful little island!" He sniffled emotionally, and a Krawk tear slid down his cheek. MissFrizzy scowled. This sounded funny. "And let me guess, you own all the digging rights?" the Zafara asked. "That's right! You can ask the governor yourself, if you don't believe me. Even he doesn't own any," the Krawk chuckled. "Er, ahem. So that will be three hundred Neopoints, if you'd like to look around." When he saw MissFrizzy's hesitation he added, "You're lucky I don't charge in dubloons, like everyone else here! Special Neopoints fee, just for you." "Alright," said MissFrizzy, pulling out her money pouch. She regretfully handed over her money, putting a much lighter pouch back into her pocket. The Krawk was gleeful as she picked her location on the map. "Here are the rights, to be returning in three hours!" he told her. "Happy digging!" Three hours later, the Zafara found exactly zilch. Grumpy and disheartened, she returned to the Krawk. "Oh, don't look so glum," said the Krawk consolingly. He was busy counting a large pile of Neopoints. "Would you like to try again? You can't say you really tried with only one attempt." Again, the Zafara agreed, and she handed over her Neopoints. This time she picked a location on the opposite end of the island. After three hours, she found nothing. She hurried back to the Krawk, a determined gleam in her eyes. After several days of perseverance, MissFrizzy failed to find any treasure. She sat down on the edge of the wharf and stared into the water sadly. "Oh my," said a familiar voice. "What's wrong? I almost mistook you for a grey pet, your face is so long!" It was the sailor Krawk. He sat down next to her. "You can tell me." MissFrizzy sighed. "I've spent all my money trying to find treasure," she said. "And I've found nothing. Now I have no way to get home." And it's my birthday, she thought. But the Krawk didn't need to know that. "Oh, it sounds an awful lot like you've been spending time at my cousin's little treasure booth! Am I right?" "That's right, and a real jerk, too. His little buried treasure business is a rip off." "He likes to take money from unsuspecting Neopets like you. You see, he buries the treasure himself so that it's only occasionally discovered. 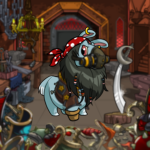 It's a small amount of his real fortune, but it keeps Neopets coming back. And it's perfectly legal, too." The Krawk shook his head. "There are ways to find treasure on this island without playing his little game, but few Neopets know that." MissFrizzy let out a scream. The frustration pent up from days of fruitless search spilled out of her all at once. "I'm going to get him for this!" she shouted, springing to her feet. "Give him one for me!" The sailor cheered as she ran away. The untrustworthy Krawk knew he was in trouble the moment he saw the Zafara. He cowered as she charged right up to him. "Er," he said. "We're closed. Sorry about that." He reached shakily to place a closed sign in front of the booth. "Come back later." MissFrizzy slapped the sign away. "You," she growled. "Give me enough money to get off this island and back to my family." "No refunds," said the Krawk. A few moments later, MissFrizzy tossed her new coin pouch in the air as she walked away. The Krawk lay on his back, tiny Pawkeets flying around his head. He groaned. MissFrizzy arrived home to a small gathering of her family. Her younger siblings and owner sat around the kitchen table, looking sadly at a birthday cake. "MissFrizzy!" Her younger sisters gasped in surprise. "Guys!" the Zafara cried happily, and everyone collided in a group hug. "Oh Anna, I'm so sorry I was gone for so long." "It's fine," said Anna with a smile. "Happy birthday! Have some cake before your siblings eat it all." MissFrizzy laughed and hugged her family. She knew she had found real treasure. She'd had it all along. "Excuse me, ma'am," he requested politely, "do you have a moment to discuss the word of Dr. Sloth?" D immediately turned back into her home, slamming the door. She clung to the frame for a few seconds. Viishus runs into trouble in the Warf Wharf... that is, until someone lends a hand.